How Is Retina Detachment Treated? After a detailed examination in the office (which may require an ocular ultrasound), the retina surgeon will decide the best way to repair the retina detachment. In general, there are 3 ways to repair a detached retina: vitrectomy, scleral buckle, and/or pneumatic retinopexy. Sometimes a combination of these procedures may be necessary to reattach the retina. Here is a quick overview. 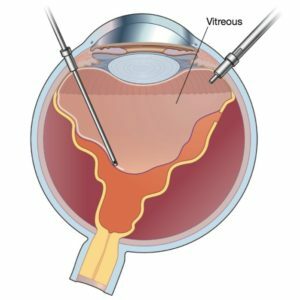 This is an outpatient surgery where the retina surgeon removes the vitreous gel, reattaches the retina, and treats it with laser. At the end of surgery, the eye is filled with a gas bubble to “splint” the retina. The gas bubble is gradually absorbed by the eye over a period of 2-6 weeks. 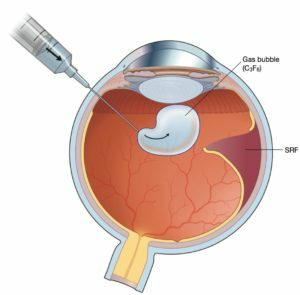 In cases of complicated retina detachment, the retina specialist sometimes fills the eye with silicone eye (instead of the gas bubble). This may require a second surgery a few months later to remove the silicone oil. 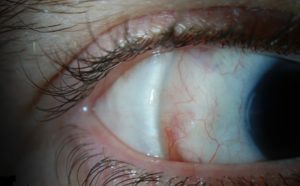 In this eye surgery, a silicone band is sewn around the circumference of the sclera (the white part of the eye), right beneath the conjunctiva. This will bring the retina in close proximity with the wall of the eye, essentially reattaching the retina and closing the retinal tear, thus repairing the retina detachment. The surgery usually involves cryotherapy or laser. This is to form a permanent adhesion (“spot welding”) around the retinal tear to prevent re-detachment. The scleral buckle is usually left in place permanently, although it can be removed if needed once the retina heals. This procedure can only be done for certain types of retina detachment. Your surgeon will tell you if you are a candidate.